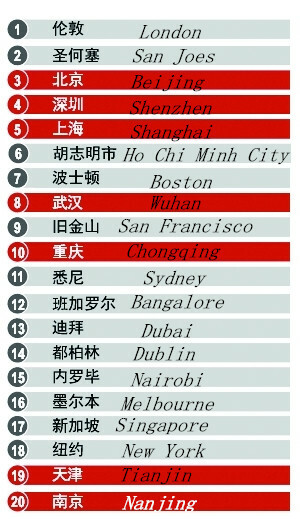 JLL ranks the world’s top 20 cities based on City Momentum Index. Chinese cities are lit red. This year, JLL released the second annual list of City Momentum Index (CMI), based on 120 main mature and emerging commercial centers worldwide. It valued the cities’ short-term (taking 3 years as a time interval) socio-economic drivers and commercial real estate momentum, and investigated the long-term variables (including education basic infrastructures, creative abilities and envirnment, etc) which could impact the cities’ economic strength and real estate drivers in future. Even though China slowed down the ecnomic growth, 7 Chinese cities were listed among the top 20 dynamic cities worldwide, in which, Wuhan ranked the eighth, prior to all the 1.5-tier cities in China two years in a row. JLL also released the China Cities Top 60 based on GDP, population, affluence, investment, retail sales, household savings, educational infrastructures, land transfer amount and retail companies. Finally, sixty cities was selected from 287 cities, among which, Wuhan ranked the fourth. JLL, a financial and professional services firm specializing in commercial real estate services and investment management, creates value for companies and institutions that invest in and use real estate. With 52,700 employees across 200 corporate offices worldwide, they serve the local, regional and global real estate needs of corporates and investors in more than 75 countries. Their integrated services offering is grounded in expertise in all property types, a deep understanding of real estate markets and capital markets, and is coordinated and consistent across geographies.